So you might have heard that bacteria build up in the mouth is detrimental to the entire body, right? And you might wonder what exactly works to combat this harmful bacteria? Because we work hard to avoid “endocrine disruptors” of various kinds, we also don't want them in our mouthwash and/or anything that touches our face or mouth. Many of us with fibromyalgia have compromised immune systems and we cannot afford to be any further compromised by either bacteria OR by chemicals or alcohols used to mitigate the bacteria. Oil pulling is an easy and effective method of naturally destroying the bacteria in our entire mouth (between our teeth, around our gums, on our tongue and in the back of our throat area). Prevention of all disease is about removing as many of the potential causative factors as possible. If you or anyone in your family suffers from heart disease, oil pulling is an effective and non-invasive remedy to controlling the harmful bacterium, known to be one perpetuating factor in this condition. Other oil pulling techniques usually advise that either coconut oil or other recommended oils be swished in the mouth for a period of about 20 minutes. My technique shortens this time, and can be done while getting ready for the day in the morning before breakfast, or at night while getting ready for bed. This way we can avoid boredom. I started doing it this way because most people will not “swish” for the recommended 20 minutes and will quickly abandon this excellent method of oral hygiene. I have a technique that I use for oil pulling that works well and makes it easier by using Swanson EFAs organic coconut oil capsules that can be stored easily in the bathroom rather than storing a jar of coconut oil and is also more cost effective. I also combine with a very small amount of 3% hydrogen peroxide that is appropriate for using as a mouth rinse and commonly found in any drug store. Simply put one or two (I use two) capsules of organic coconut oil in the mouth, with a few drops of hydrogen peroxide. Chew on the soft capsules until they break open, continuing to chew and swish both of these in the mouth for at least 10-minutes. The outer capsule will dissolve into the liquid in your mouth after chewing. 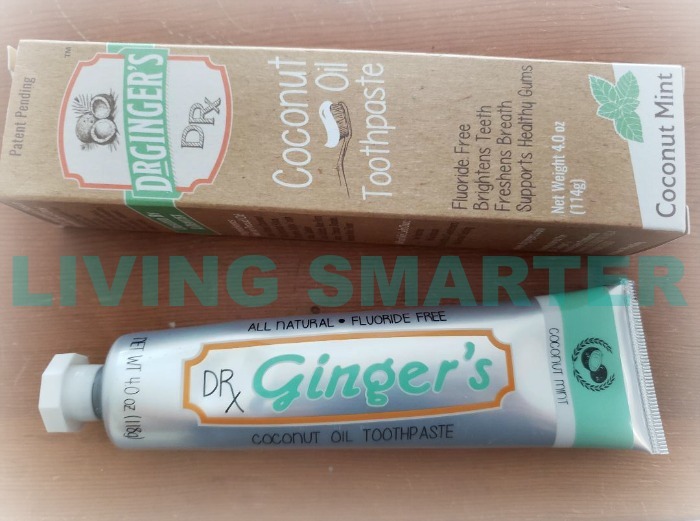 Try this coconut oil toothpaste (same one shown at the top of this article) Dr. Gingers coconut oil toothpaste is great tasting and helps to SAFELY brighten your smile. Try the oil pulling method I detail above by starting with just a few minutes and work up as you can. I should add that other oils are also useful for “pulling”. A couple of them are sesame oil and neem oil. However, I developed the more readily available “coconut oil capsules/peroxide” method to reduce the normally recommended time for “pulling” from 15-20 minutes to my recommended 10-minutes in hopes that you will be more consistent in applying it. Those teeth whitening strips you may see on the market are often made of toxic ingredients that we do not want to be absorbing inside of our mouth and bodies. A safer alternative is to rub a few drops of 3% hydrogen peroxide and a small amount of baking soda into teeth, do not brush, just rub with finger or cloth into teeth for 1-2 minutes, then rinse.